Birla Sun Life Mutual Fund has recently launched new RSP. 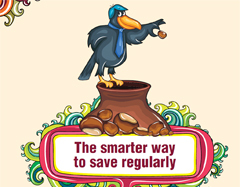 You will find advertisement in all leading newspaper and TV channel about this recurring saving plan. They are trying to attract investor by showing old famous story of “The Crow & The Pitcher”. While checking actual plan detail you will come to know that it is same old Systematic Investment Plan concept coupled with free insurance and renamed as “Recurring Saving Plan”. This is an open ended income fund primary investment objective of the Scheme is to generate regular income through investments in debt & money market instruments. Return in this fund since inception is 8.06%. This is also income fund with primary investment objective to generate regular income and long-term capital growth through fixed income securities with a small exposure to equities. Based on above we can simply assume that return under Recurring Saving Plan will be around 8%. Investors should note that once RSP is availed, RSP amount cannot be changed through the tenure. In case of joint unit-holders, only the first unit holder would be eligible. In cases where investor is not eligible or not complied with the requirements, RSP will be registered without the cover. All the above mentioned limits are subject to maximum cover of Rs. 20 lacs per investor across all schemes/plans/folios. Insurance Starts with the commencement of RSP. However, only accidental deaths will be covered for the first 45 days. At the end of the tenure. i.e. upon completion of 55 years of age. Discontinuation of RSP installments within 3 years from the commencement of the same. Redemption / switch-out (fully or partly) of units purchased under RSP before the completion of the RSP tenure. There shall be no provision for revival of insurance cover, once the insurance cover ceases as stated above. Death due to suicide within first year of commencement of RSP. Death within 45 days from the commencement of RSP installments except for death due to accident. 55 Years minus current completed age of the investor. In the unfortunate event of death of the investor, there is no exit load. (1) Rate of return in case of RSP is variable compare to recurring deposit. (2) Free Life cover is available for consistent investors of Birla recurring saving plan. (3) If you are insured sufficiently then this plan is nothing but pure SIP in debt fund. (4) The exit load of 1% – 2% is on the higher side. (5) If you consider the average returns might be in the range of 6-7%, If we consider post tax return of FD it will be same. Should I Invest or not? Both fund offered under this scheme is good & providing approximate 8% returns, but looking at current situation investment in debt fund for longer period is not advisable. Another point is that FD, NCD or RD can provide you secure and safe returns compare to RSP. In case of RSP you have to pay exit load if you want your money back within 3 years. Only advantage in RSP is free insurance cover so at certain age where you can’t find low cost term plan you can think of this product to fulfill your partial insurance need, but that is also up to tenure of the plan. In short “Recurring Saving Plan” is nothing but old wine in new bottle or one alternative to recurring deposit. If possible stay away from this plan.